Continental Resources is one of the largest operators in the Bakken Shale. The company was an early entrant in the Elm Coulee Field in Montana and began exploring in North Dakota in the early 2000s. 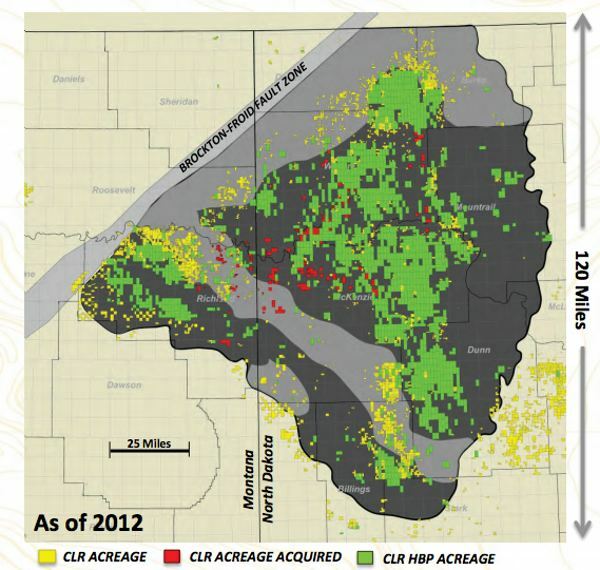 The company current holds or has agreements in place for 1.1 million acres prospective for the Bakken Shale. As of the latter half of 2012, more than 60% of the company's production was attributable to the Bakken. Continental Resources is one of the top ten oil producers in the U.S. and is the largest leaseholder in the Bakken Shale of North Dakota and Montana. The company was founded in 1967 by Harold Hamm and is based in Oklahoma City, OK. The company's headquarters moved from Enid to Oklahoma City in 2012. Other major assets include the Red River units in North Dakota and South Dakota, and the Anadarko Woodford in Western Oklahoma. Continental's Bakken production averaged 139,602 Boe per day in first quarter 2016, a slight increase over fourth quarter 2015. The Company had no stimulation crews in the Bakken during first quarter 2016, but brought online 10 net (12 gross) wells that had been drilled and completed in 2015, but not actively produced until first quarter 2016. Continental also participated in 5 net (42 gross) non-operated Bakken wells during the quarter. Enhanced slickwater and hybrid completions continue to improve Bakken well performance. Continental now has 118 30-stage, 2-mile enhanced-completion wells in Williams and McKenzie counties with at least 180 days of production history. These wells are showing 45%-to-60% higher 180-day production rates and 35%-to-45% higher EURs when compared to direct offsets with historical standard designs. These initial production uplifts and higher EURs are superior to previously announced gains. The current completed well cost for a Bakken well is approximately $6.3 million, down $0.5 million from year-end 2015. Continental is targeting an operated completed well cost of $6.0 million by year end. Continental also continues to reduce lease operating expense in the Bakken in first quarter 2016. On a monthly basis, operated Bakken net lease operating expense was reduced by $3.1 million per month, down 25% from first quarter 2015, while increasing the net operated well count by 10% in the Bakken during this time period. Continental expects to end 2016 with approximately 195 gross operated drilled and uncompleted wells (DUCs) in the Bakken. The year-end 2016 DUC inventory represents a high-graded inventory with an average EUR per well of approximately 850,000 Boe. The Company's current estimate of average capital cost to complete the DUC backlog is approximately $3.5 million per well. At $45 WTI, the cost-forward rate of return on this current incremental capital would be more than 100%. The Company has four operated drilling rigs in the North Dakota Bakken and plans to maintain this level through year end.Continental in April temporarily deployed a completion crew to complete the Maryland 2-16H and the Nashville 2-21H wells, which are beginning flow-back operations this week. The Company plans to have four additional operated Bakken completions this year, and currently has no stimulation crews deployed in the Bakken. Continental's Bakken production averaged 136,400 Boe per day in fourth quarter 2015, a slight increase over third quarter 2015. The Company completed and initiated first sales for 22 net (105 gross) operated and non-operated Bakken wells during fourth quarter 2015, compared with a total 171 net (638 gross) operated and non-operated Bakken wells for full-year 2015.Continental's operated wells with initial production in fourth quarter 2015 involved wells that had been previously drilled and completed, but not actively produced with first sales until the fourth quarter. In 2015, the Bakken team doubled capital efficiency and cut finding costs in half. This was accomplished through a combination of inventory high-grading, cost reductions and operating efficiencies. The Company reduced average drilling time for spud-to-total-depth (TD) by 23% and average drilling cost by 33%, compared to fourth quarter 2014. The average spud-to-TD time in fourth quarter 2015 was 13.4 days for a well with a two-mile lateral, down from 17.4 days for fourth quarter 2014. In 2016, the Bakken drilling program will continue to focus on high rate-of-return areas in McKenzie and Mountrail counties, targeting wells with an average EUR of 900,000 Boe per well. Based on the higher EUR and a lower targeted completed well cost of $6.7 million per well, the Company expects capital efficiency to increase 17% and finding cost to decrease 15% in 2016. Given its plans to defer most Bakken completions in 2016, Continental expects to increase its Bakken DUC inventory to approximately 195 gross operated DUCs at year-end 2016. The year-end 2016 DUC inventory represents a high-graded inventory with an average EUR per well of approximately 850,000 Boe. At year-end 2015, the Company's Bakken DUC inventory was approximately 135 gross operated DUCs. The Company currently has four operated drilling rigs in the North Dakota Bakken and plans to maintain this level through year end. The Company currently has no stimulation crews deployed in the Bakken. Continental's Bakken production averaged 140,988 Boe per day in the second quarter of 2015, an increase of 4% compared with first quarter 2015 and an increase of 30% compared with second quarter 2014. The Company completed 56 net (159 gross) operated and non-operated Middle Bakken and Three Forks wells during second quarter 2015. In the most recent quarter, the Company operated an average of 10 rigs and three completion crews in the Bakken. Continental's 2015 Bakken drilling program is focused on core leasehold in Williams, McKenzie, Mountrail and Dunn counties, targeting an average estimated ultimate recovery (EUR) of approximately 800,000 Boe per well. Overall, this concentration in the core of the play, combined with a 20% reduction in completed well cost, is expected to increase capital efficiency in terms of reserves per capital dollar invested by approximately 80% and to reduce finding and development costs per Boe by approximately 45% compared to full-year 2014. Most wells are being completed using a 30-stage enhanced completion with either slickwater or hybrid completion designs, depending on the specific formation and reservoir domain. Wells in Williams and McKenzie counties completed with these designs continue to deliver an average 90-day production increase of approximately 40% for hybrid completions and 50% for slickwater completions, compared with offset legacy wells with previous cross-linked gel completion designs. EUR uplifts have been in a range of 25% to 45%. The Company estimates it has at least 10 years of drilling inventory, with wells averaging 775,000 Boe per well in EUR, in the core of the Bakken. This assumes an average of 15 operated drilling rigs per year and no additional improvements in drilling or completion technologies. The Company currently has 95 gross operated Bakken wells drilled and waiting on first production, compared to 115 at the end of first quarter 2015. The Company currently expects to increase this total to approximately 100 gross operated Bakken wells drilled and waiting on first production at year-end 2015. Continental's Bakken production averaged 135,538 Boe per day in the first quarter of 2015, an increase of 4% compared to fourth quarter 2014 and an increase of 39% compared to first quarter 2014. The Company completed 66 net (199 gross) operated and non-operated Middle Bakken and Three Forks wells during first quarter 2015. During the first quarter, the Company operated an average of 13 rigs in the Bakken, down from 19 rigs at year-end 2014. The Company plans to average 10 operated rigs through the remainder of 2015, based on current market conditions. Continental significantly reduced its completion crew count in the Bakken during the first quarter of 2015, as planned. The Company has three completion crews active, down from 10 at year-end 2014, and plans to maintain approximately three crews throughout 2015, based on current market conditions. The Company currently has 115 gross operated Bakken wells drilled and waiting on first production, compared to 122 at year-end 2014. The Company expects to have approximately 90 gross operated Bakken wells drilled and waiting on first production at year-end 2015. Continental's 2015 Bakken drilling program is focused on core leasehold in Williams, McKenzie, Mountrail and Dunn counties to maximize returns. With this concentration on the core of the play, the Company is also entering the first stage of full-field development. Approximately 60% of the wells in the 2015 program will be drilled on 660-foot to 880-foot inter-well spacing in the Middle Bakken and Three Forks reservoirs. The Company plans to continue completing wells in its 2015 Bakken drilling program with 30-stage enhanced completions to maximize production rates and recoverable reserves per well. In Williams and McKenzie counties, where the Company has its largest data set, enhanced completions are delivering an average 90-day production increase of approximately 40% for hybrid completions and 50% for slickwater completions, compared with offset legacy wells. The Company is projecting estimated ultimate recovery (EUR) uplifts in a range of 25% to 45% for enhanced completions in Williams and McKenzie counties, and, as it expands drilling activity into Mountrail and Dunn counties, it expects to see similar uplifts in production and EURs. The Company's 2015 Bakken drilling program is targeting an average EUR of approximately 800,000 Boe per well. Continental's Bakken production averaged 130,783 Boe per day in the fourth quarter of 2014, an increase of 8% compared to third quarter 2014 and an increase of 40% compared to fourth quarter 2013. For full-year 2014, Bakken production averaged 114,715 Boe per day, an increase of 30% compared to 2013. The Company completed 72 net (234 gross) operated and non-operated Bakken wells during fourth quarter 2014 and 312 net (921 gross) operated and non-operated Bakken wells for full-year 2014. The Company operated an average of 23 rigs in the Bakken field during fourth quarter 2014. As of February 20, 2015 the Company was operating 12 rigs in the Bakken field and expects to be down to 10 rigs in March with plans to keep an average of 10 operated rigs in the play through year end. The Company entered 2015 with 10 stimulation crews operating in the Bakken and expects to be down to four in early March due to deferring completions, which is a reduction from the original plan to have eight crews throughout March. The Company expects to continue with four stimulation crews through year end. The 2015 Bakken drilling program will focus on the high rate of return areas in Williams, McKenzie, Dunn and Mountrail counties, targeting an average estimated ultimate recovery ("EUR") of 800,000 Boe per well. Enhanced completion techniques will be used to complete the wells using a combination of slickwater and hybrid stimulations. Results of the enhanced completions are being monitored closely and continue to deliver 30% to 45% uplift in initial 90-day rates and an estimated 25% to 30% increase in EURs based on early results. Utilizing new pipeline transportation optionality, Continental will have the ability to shift a substantial portion of its crude oil from rail to pipeline during 2015. Continental will continue to utilize a balanced approach to reach the best markets utilizing rail, pipeline and local markets, including new North Dakota refinery capacity. Continental's Bakken production in the third quarter of 2012 was 62,453 boe/d or 81 percent higher than the same time 2011 and 17 percent higher than the previous quarter. During the quarter, CLR participated in 137 gross (46 net) wells in the Bakken. Continental completed 46 gross (34 net) operated wells in the Bakken in the third quarter of 2012, with 41 gross (29 net) wells in North Dakota and 5 gross (5 net) wells in Montana. Production from wells drilled in the third quarter averaged 1,076 boe/d in North Dakota and 886 boe/d in Montana (24-hr rates). In ND, 22 of the 41 wells came online at more than 1,000 boe/d, while two of the five wells in MT eclipsed that level of production. The Antelope-Bohmbach ECO-Pad in McKenzie County, consisting of the Antelope 3-23H and 4-23H and the Bohmbach 3-35H and 4-35H wells. The four wells tested at an aggregate initial rate of 6,240 boe/d in total, for an average of 1,560 boe/d per well, with average flowing tubing pressure of 3,800 psi. Continental has an 85 percent working interest in the wells. Continental is the leading leaseholder in the Bakken, with 984,040 net acres at September 30, 2012. The Company currently has 19 operated drilling rigs in the Bakken, including 15 operated rigs in North Dakota and four in Montana. The company has also agreed to acquire 120,000 acres in Williams and Divide counties for $650 million.